Fig. 1: Mesoamerica and the Caribbean are low-latitude regions that are highly susceptible to the effects of global climate change. 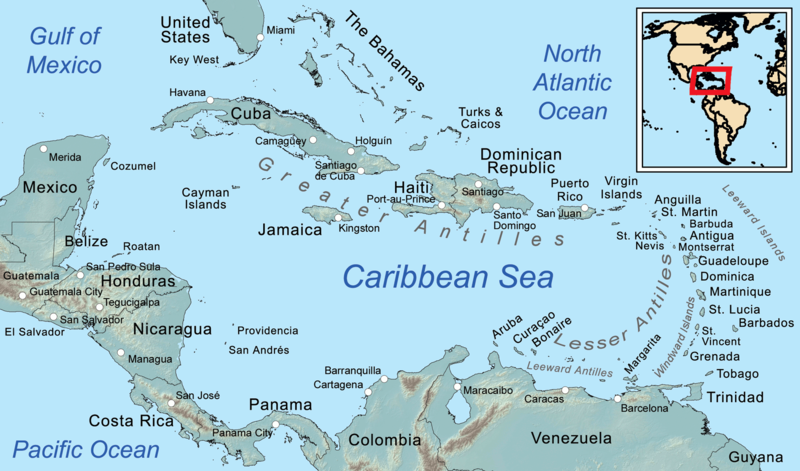 Due to their low-latitude location, Mesoamerica and the Caribbean are at particularly high risk of experiencing the effects of climate change. There are currently many global models that show the effects of climate change on a large scale, but fail to take into account the effects that topography and land use have on temperature and precipitation. This prompted Robert Oglesby, of the Department of Earth and Atmospheric Sciences at the University of Nebraska, and a team of researchers to find a more detailed model. . The team used the Weather Research and Forecasting Model (WRF) and lowered the resolutions of the images from 100 km to 4-12 km. These lower resolutions allowed for analyses that took topography and land use into account. The team used baseline models from 1991-1993 to eliminate any bias and provide a calibrated control. They then ran two models: a present day model from 2006-2010 and a model for 50 years in the future from 2056-2060. Through comparison of the two models, the team discovered that temperatures are expected to increase everywhere, but more drastically in highland regions. These warmer temperatures can have detrimental consequences; evapotranspiration stress will increase, leading to stress on agriculture, water resources, and biodiversity. Precipitation patterns were harder to track since there were contradictions between the WRF and the global models, but the researchers concluded that topography plays a direct role in precipitation levels. While this study provides a good baseline of information about climate changes in this region, future research can still be done involving the correct resolution to use, as well as fine-tuning the modeling strategy. R. Oglesby, et al., A high-resolution modeling strategy to assess impacts of climate change for Mesoamerica and the Caribbean. American Journal of Climate Change 5, 202-228 (2016). doi: ajcc.2016.52019.